You Want to Watch What?! I want to start by saying that anyone who says there’s nothing to do in Lehigh Valley is crazy! Especially if they say there’s nothing free to do. Bear Creek Mountain Resort had two, big, free events this past weekend; the cardboard box derby on Saturday and pond skimming on Sunday. For the past several years I’ve gone to watch Blue Mountain’s pond skimming event. This year I decided to be a spectator at Bear Creek’s event instead. Like most resorts they had a ‘pond’ cut out at the end of the slope. After the first few skiers’ came down I was able to get a front row view. I got to see two skiers make it across the pond and got it on video to boot! [youtube]http://www.youtube.com/watch?v=tqDzP0WhfyA[/youtube] The one guy had a mullet and a can of PBR in hand as flew by us and down the slope. There were several other funny/good costumes. The best were when Buddy the Elf made an appearance, several young ladies dressed like Tom Cruise in Risky Business and of course someone wore the classic chicken costume. One by one, skiers and snowboarders alike fell into the pond, all of them with the same reaction, “HOLY CRAP THAT’S COLD!” I didn’t witness any snowboarders make it. As soon as the snowboarders hit a certain point of the slope they immediately slowed down, not intentionally. A few of them took advantage of this as they entered the pond with creative style…by soaking the crowd. I was included in the second soaking, but I didn’t get as drenched at the little girl next to me, poor thing. He dad took her inside and placed her under the hand dryer for a while and before I knew it, she was back for more. Just before I threw in the towel for the day, I saw this;[youtube]http://www.youtube.com/watch?v=BUJTZuqtvKI[/youtube] Yes, a guy in a canoe came down the hill. Yes, from the top of the slope, a man came all the way down into the pond paddling a canoe. You’re welcome, I’m happy that I could share that with you. 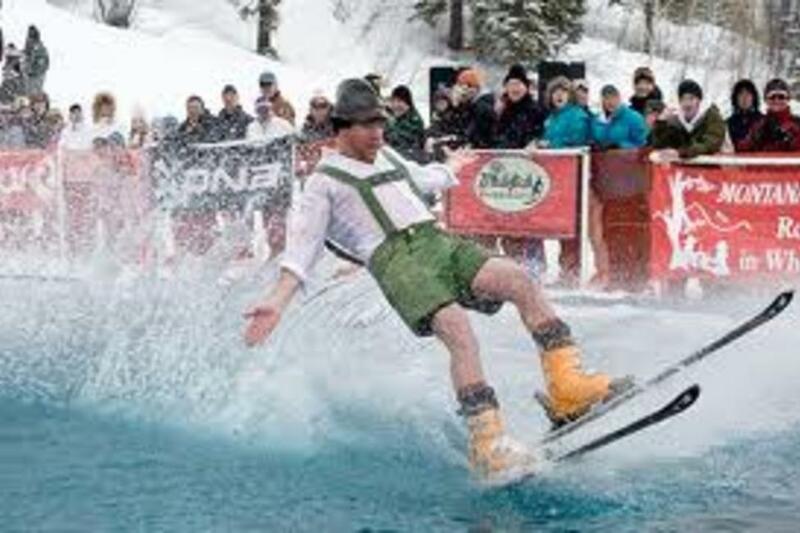 Where do you watch pond skimming?